These are very special peonies, with a very strong will. Every year the flowers grow bigger and bigger, and the plant grows taller and taller. Here she is with her blossoms just opening a few days ago, right before the rain came. She's happily growing along with the hydrangeas that are just starting to bud. She's special because I didn't plant her. She just popped up from the earth one spring and was a delightful surprise. We were happy to see her because we knew she had been tossed and turned during the yard excavation but found her way despite it all. Amazingly, she happened to pop up in a new, nearly established flower bed. This is the bed several years ago. I've circled her first spring showing in bright pink. At the time, we were still building our picket fence, hadn't installed sprinklers, or put in the front flower beds. And the drains had yet to be buried underground. Whew, I'm tired just thinking of all the work we had ahead of us! The peony came from somewhere in the overgrown front yard. This is what the property looked like when we first purchased it years ago. 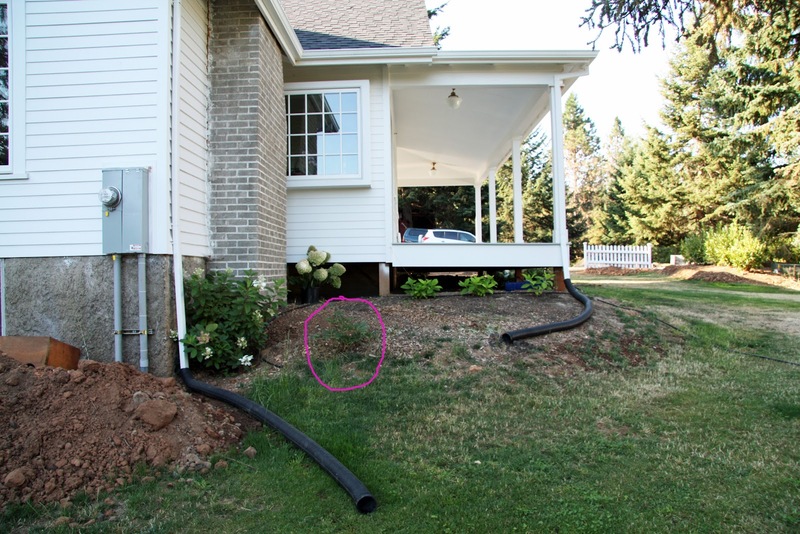 The yard was excavated when we 'dug out the house' and put in appropriate drainage (due to issues with water in the basement). You can see a card table and chair on the front lawn I set up one day as I contemplated our 'to do' list! I wish I kept that list as I can assure you that it was missing about one million or so tasks we hadn't even imagined. 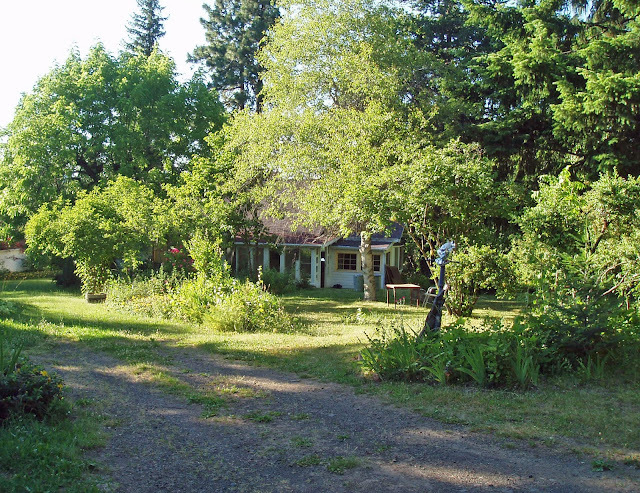 Here is the yard after excavation (and a few seasons of growth). The house is now above ground but unfortunately, the old flower beds and some trees were lost (although several were ill due to rot). This is the view looking out from the house. Because we took all the earth excavated from this part of the yard and used it to extend and level out the back yard, the peony was serendipitously transplanted. So as you can imagine, we are quite proud of her! Such a beautiful peony and so tenacious! She is inspiring, as are you and Mike. You have come such a long way with the house. It's wonderful to see the transformation again. I have been enjoying the pictures of you and Mike and the twins. oh i love peonies! they are so dramatic and beautiful!! I love when plants do that - survive and thrive despite less than idea conditions. My husband had a client that was about to completely re-landscape his property and was going to remove all the 50 year old azaleas. He said we could take what we wanted. So we dug up about a dozen and replanted them in our yard. All but a few died. But one of the ones that died had a stow-away and a rose bush popped up where we had planted it and has gotten increasingly bigger and healthier each year. It even is okay with the shady location we picked for the azaela. I love looking and reading about your home and gardens. Very inspirational. Lucky you, I have tried to grow peonies, but I don't think they like our climate. I absolutely adore them, and will keep trying. I've heard there is a new one that will grow well in southern California. Yours are lovely! Happy Sunday. What a wonderful story! I'm forever amazed at the determination of plants to thrive--it's sheer will. I learn so much from my gardens. Thanks for sharing that story. The peonies are beautiful!! Your peony is a gorgeous color. I don't think I've ever seen a picture of this part of your yard before but I adore the fence and the landscaping. What a before and after! She is magnificent. May she bloom every year more and more lovelier than the last. Your home is beautiful and so are you. God bless. Oh my, such a beautiful, luscious Peony! the color is so vibrant! Indeed, tenacious, very much serendipitous too. Your Country Farmhouse setting, yard and gardens are fabulous. 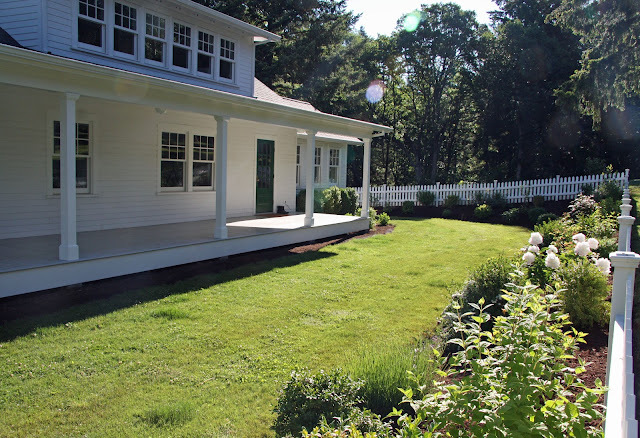 The white picket fence sets off the plantings that border. I bet it contains those two little ones too. Your years of work certainly are realized in these photos. Look how far you have come. Amazingly beautiful . . . I love the peony! They were my Mom's favorite flower, so I'm sure to plant them in every yard I have to remember her. I am so impressed with the vision that you had for your farmhouse as well as the energy to take it from a bit shabby to absolutely gorgeous! What a fabulous story! I have to say that living in an 80 year old house, we saw a peony plant pop up. I was so delighted to know one existed as peonies are my favorite flower. I think about the person who first planted it and how many years it has survived. When we first moved in I remember there was one bud that barely flowered so I decided to split the plant and see what happens. I am so happy to say that now I have two peonie bushes that flower like crazy!!!! Mine are the same lovely color as yours. They are such little miracles. great photos trina. i always love a good before and after story and i think your home is the absolute best example of one. i think of you every time i wash my front porch! I don't think I've ever seen that "before" picture. What a transformation you've made not only on the house but the entire property! Really wonderful to see! I guess that is what one calls A Happy Accident!? PS. A very close friend of mine is moving to Oregon within the month, and I gave her your blog to look up... I wish I could join her, but I am looking forward to visiting! What a wonderful surprise! I love how Mother Nature shows us who really knows how to do things. Beautiful photos, as always! Beautiful! We had to transplant some of ours due to some other work in our backyard. One survived the move, the others I am praying will show back up next spring. what a shocking before and after, what vision you both held! You have every reason to be so proud of the peony - and the changes you have made. You have done a phenomenal amount of work, your house and yard today are magnificent. Peonies are my favorite flower and believe it or not I grow them here in N. Texas! When we have seriously cold winters, they produce beautifully. This last year we had hardly any winter,mso I threw bags of ice on them each week. What a stunning color your peonies are! Truly amazing! I know how hardy a peony plant can be. Our next-door neighbors tried to remove their plants (why, I'll never understand) and each year one or two kept popping back up. They planted some boring holly bushes in their place and eventually the peonies stopped appearing. If one ever springs back to life, I'm going to dig it up and transplant it our yard! I was just wondering, do you still have a basement? What a gorgous yard Trina ! A inspiration to all of us ! Have a great start of the week. Leonore are my favorite flow this is a wonderful story. A beautiful story on your lovely, and tenacious, old peony. Don't you wonder who planted her so long ago? What a vivid color! You have such a beautiful blog...I have enjoyed looking around. Your babies are just precious! Wow...beautiful everything and I love the fullness of peonies. I like the first picture! What a lot of work you have done. The yard and house look amazing. I love peonies and have 5 different ones spread around in my yard. I just purchased a new one this year called sorbet. It is one I found on pinterest. I do also have one the same color as yours, beautiful. 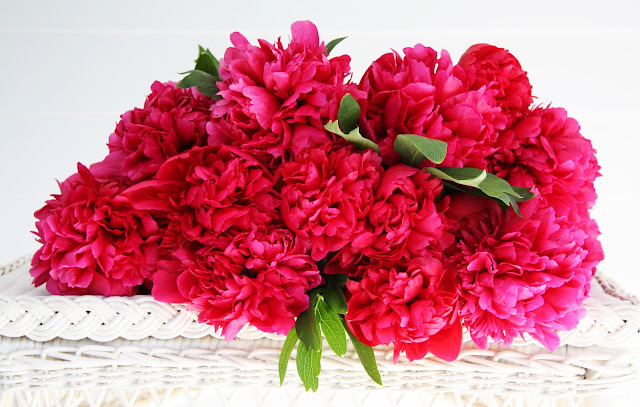 Beautiful coloring on your peonies! Certainly a persistant one, you certainly have every right to be proud of her along with all of your gorgeous plants! Beautiful flower and beautiful home, you are amazing. Gorgeous flower, and it appears to be very happy to have been moved to such a prominent spot!!! The house transformation is amazing!!! ...I wonder what her name is? My girls are ready to blossom any minute. The Olympic Peninsula has been masked in clouds but thie week sun returns. Your peonies and your home are beautiful. I can not grow them in Georgia, but love them. I have an abundance of hydrangea growing in my garden right now. They are my peony substitute. I believe there is a fairy in your life...every story is enchanting!!! i'm glad to read that your peony bush is a fighter!! that gives me hope that i didn't murder my poor peony plant when i tried to move it to a new location this year! Such an unexpected outcome! Knowing how fragile peonies are when transplanted (don't theyusually go into a bit of a swoon for a year or two after being moved? ), it's rather extraordinary that this one just tucked into the new location and 'leaned in' to its new life. And such a beautiful, beautiful color....a rich raspberry. Beautiful! She's gorgeous and does look happy with her hydrangea neighbors. I've been wanting to try peonies, now I know where to plant one. She's a real trooper, that's for sure (not unlike yourselves - lol!) - and SO beautiful! I love peonies and I love that they are such survivors! When I was first learning to garden, I planted one but thought I lost it and proceeded to mow that area for the rest of the summer and all of the following summer. A year and a half after I thought I lost it, I was shocked to see the peony poking through in spring. She too has gotten bigger every year and I love how unique she is! What a magnificent achievement, both your's and the peony's. She has survived to reward you for doing the right thing and transforming and resurrecting your abode and garden. Congratulations! Wow that is a very tough peony! Such a striking colour too. The before and after photos are quite striking. I like to think that as we redo these neglected houses,they somehow are happy again. When that peony bloomed, it was as if the house/garden said "Thanks, so glad you are here..."
We have a place built in 1948 (near Bend, OR) and I 'm pretty sure we have the same peonies-here's a link. They are called Kansas,and they won a gold medal in 1957. We moved about ten of them last year when we did our front yard landscape makeover. They are hardy things, and one perk of living where the winter is long and cold. Can't wait til summer gets going here already! Such an amazing transformation! I know how these to-do lists pile up (in the middle of a home transformation myself) and it is always fun when your house gives you a surprise, even if it is such a simple thing like beautiful peonies. That's a beauty. Peony pants can live a long time...like 50 years or more given the chance. The 30 I brought from my mom's garden were probably 25-30 yo. They are settled I and bloomed like crazy this year. What a beautiful peony! 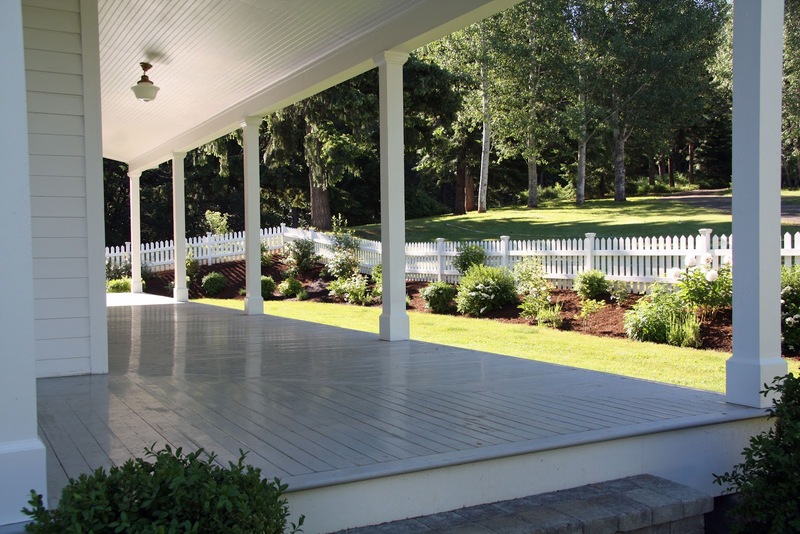 Your porch is absolutely stunning. I think I'd wind up spending all of my time on a porch like that, but I imagine you've done wonders with the inside of the house, too. So glad to have found your blog. Now I'm going to go explore and enjoy your other home projects. Thanks! "Excavating the house" boggles the imagination! Nature will always find a way. Your lovely peonies remind me of that. Those peonies are gorgeous but i love your front porch even more! Really magnificent view! 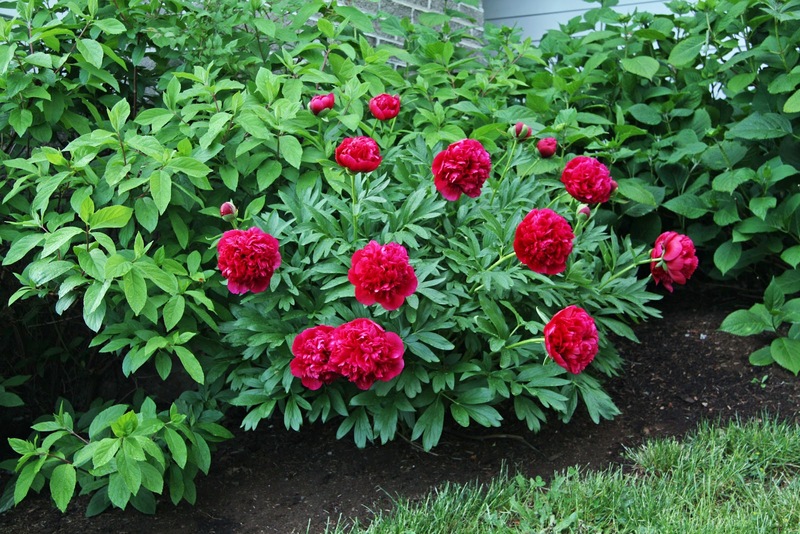 I can't even get my peonies to grow with all the tlc possible...amazing story and gorgeous color! Just popping in to say how seriously gorgeous your blog, house and family are. Lover your blog. Reading your blog when living in another part of the world really fills my imagination and enhances my desire to travel. It truly is beautiful! WOW. I just found your blog through Dolan Geiman's blog list and I am fully inspired. You have my dream home. I love it. Amazing color. I don't see many peonies in that color in my area. Just lovely.